The seriously-injured, make humpback whale spotted off the Gold Coast two days ago. Pic: Whales in Paradise. A MARINE scientist has called on locals to keep an eye out for a seriously injured whale spotted off the Gold Coast two days ago. 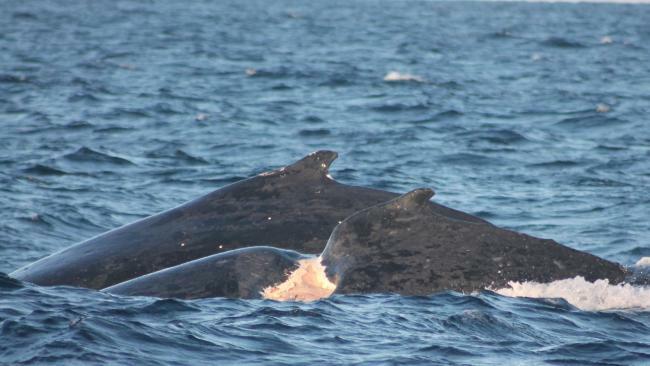 Dr Olaf Meynecke said the massive animal was sighted travelling north during a research project by the Griffith Centre for Coastal Management which is supported by Whales in Paradise. "The severely injured, fully-grown humpback whale had very visible injuries to its back. It had major damage near its dorsal that likely resulted from a boat strike," he said. "A monohull vessel would sustain such injury and it's likely the accident happened during the whale's migration from the south as the wound showed signs of healing. "However, spinal damage to the whale is likely and warm waters can result in infection of the wound and consequently death," Dr Meynecke warned. "We encourage everyone to look out for this injured whale and report it to Humpbacks and High-rises so that we can monitor its survival. We hope to be able to report that is has survived." He said the injured animal was spotted about 8km offshore from the seaway. Dr. Olaf Meynecke is the chief executive of research, not-for-profit Humpbacks and High-Rises and is a whale researcher with Griffith University. "With an increasing whale population and shifts in migration, the risk of whale strikes has increased significantly," he warned. He appealed to boaties to pay extra attention to whales swimming and resting in coastal water between June and October. The sighting of the injured whales follows warnings to whale watchers to keep a safe distance from humpback whales - or face massive fines - as the city prepares for the annual migration of 33,000 of the giant mammals. Leeanne Enoch, Minister for the Environment and Great Barrier Reef, said if a person approached a whale or dolphin inappropriately, they would be issued with a warning or a penalty infringement notice and a $630 fine. "If the matter goes to court, the maximum penalty is $15,138 or $20,814.75 for special interest whales such as Migaloo," she warned. She said jet skiers were not allowed within 300m of whales or dolphins, while other vessels could approach to 100m - unless there were already three or more boats at that limit. "In that case, skippers need to stay 300m away," Ms Enoch said. "There are also special restrictions in the case of Migaloo - approach distances are divided into 'caution' zones and 'no approach' zones." The former is an area surrounding a whale or dolphin in which boats cannot travel at speeds of more than six knots or at speeds that create a wake. The caution zone extends 300m from a whale and 150m from a dolphin. The Minister reminded drone operators that they too had to comply with regulations and were not exempt from hefty fines. "Under Queensland's whale and dolphin regulations, drones are considered to be aircraft, which means they cannot go closer than 300m to whales and dolphins, or 610m in the case of special interest whales such as Migaloo," she said. "Drone operators should also follow CASA guidelines and consider the safety of people and the welfare of whales and other marine life in the area. Department of Education, Science and Training staff will take necessary action if drones are used inappropriately." Ms Enoch's warnings were echoed by research organisation Humpbacks and High-rises, which documented 22 regulation breaches by boats and 12 negative responses by whales last year. Boaties view to a humpback whale off the Gold Coast. Pic: Humpbacks and High-rises. "The number of whale entanglements - there were six officially recorded and more than 10 by the community - remains a major concern as well as increased boat traffic with dangerous close encounters between whales and boats," spokesman and marine scientist Dr Olaf Meynecke said. "Our surveys were carried out on 120 days and also noted the negative impact of a dredger operating for four months during the whale season. This raised concern for the wellbeing of whales and our initial survey results suggested avoidance behaviour by them in areas where the dredger was operating," he said. 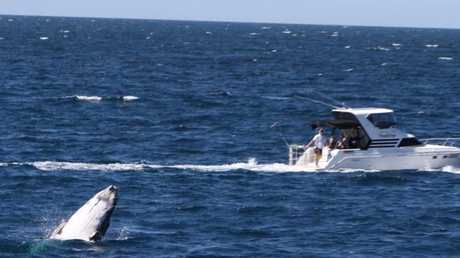 He was expecting another busy whale watching season and called on boaties to keep a safe distance. 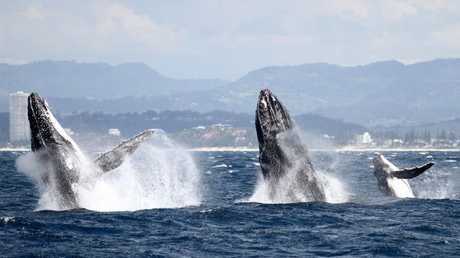 "The early return of humpback whales and the highest number of early sightings by April 14 suggests a change in migratory behaviour for a number of whales," Dr Meynecke said. 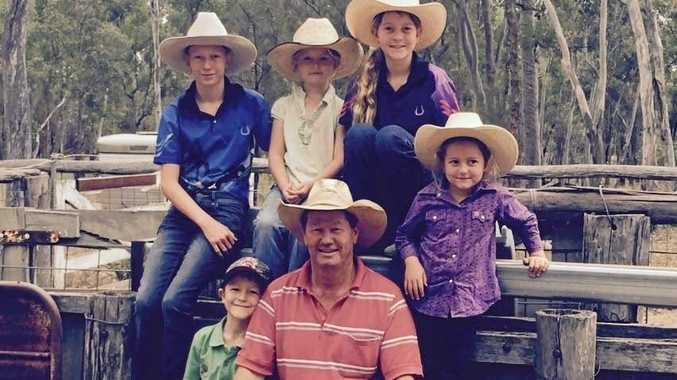 "We are also closely watching the number of newborn calves in the early season to see if the trend from previous years continuous." If you see someone breaching the whale approach limits on a boat or other watercraft, swimming or using a drone, take down the location, time, date and vessel registration details, try to get photos and videos, and notify DES by phoning 1300 130 372. If you spot the injured whale, phone Humpbacks and High-rises on 0423 115 503.